Pecans plain and fancy! Huge, plump pecan halves in a variety of fabulous flavors. Order by the bag or tin! Glazed Pecans. Georgia’s finest mammoth pecan halves are cooked to a sweet and crispy glaze. Sugar & Spice Pecans. Specifically selected mammoth pecan halves are hand-coated with a sugary blend and lightly dusted with cinnamon. Praline Pecans. 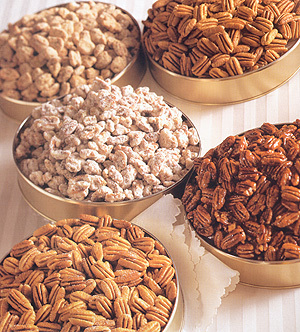 Our mammoth pecan halves individually coated in our traditional Praline Mix. Roasted Salted Pecans. Whole mammoth halves coated in butter and sprinkled with the perfect amount of salt. Georgia Pecans. Georgia’s finest natural mammoth pecan halves.